Dina Velikovskaya breathes new life into puppet making in her whimsical film My Strange Grandfather. Though puppet animation is no longer popular in Russia, the 28-year old artist taught herself to make puppets and created this heartwarming stop-motion film. Running over eight minutes, My Strange Grandfather tells the story of a little girl who can’t understand his weird grandfather and his eccentric habit of picking up trash, only to discover something magical that will make him appreciate the old man. The story lays a solid foundation for the whole film because it has a focused and penetrable center. Using only two main characters, the film was not polluted and excess sub-stories were avoided – it was easy to digest even for children. Velikosvkaya exceeded expectations when in terms of�craftsmanship. Each detail was intricately done, and the variety of colors unify in each scene. Though the story was of magic realism, the visuals were not disorienting to eye. My Strange Grandfather is an exceptional work of art that brims with imagination, originality, and beauty. 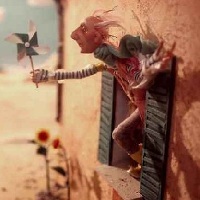 Dina Velikovskaya has outdone herself; if there is a film to resurrect puppet animation, this is a good place to start.